From the legendary Studio Ghibli, creators of Spirited Away, Howl's Moving Castle and The Secret World of Arrietty, comes another animated triumph. Yokohama, 1963. Japan is picking itself up from the devastation of World War II and preparing to host the Olympics. Against this backdrop of hope and change, a friendship begins to blossom between high school students Umi (Sarah Bolger) and Shun (Anton Yelchin)–But a buried secret from their past emerges to cast a shadow on the future and pull them apart. From a screenplay by Academy Award® winner Hayao Miyazaki and featuring an all-star English voice cast! This was a beautiful film, with a lovely, sweet feeling to it, combining a bit of nostalgia with a hopeful spirit and thought of the future. I thought the characters were particularly good - Umi and Shun are pretty well-developed, but even the minor characters have little quirks that make them memorable. 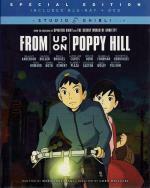 Unlike most of the other films from Studio Ghibli, this is set squarely in the real world - no touches of fantasy here. It's a sort of everyday life kind of film. Umi does her chores, goes to school, and misses her father, who was lost at sea. Shun helps his dad on his boat, goes to school, and works on the school newspaper. Together with the many of the rest of the student body, they set out to save a beloved old building on their campus. In their relationship with each other, they discover things about themselves. It's really a simple little film, sweet, calm and romantic. The animation and character design are what you expect from Ghibli: clean and beautiful, with that characteristic Ghibli look. Nobody does it like they do. While there's nothing offensive, I'd wait for children to be a bit older to show it to them - little ones wouldn't appreciate it. Think 9 to 10 and up. It's also a lovely film for adults - our audience of five included three in the mid 20's, one late 30's and one late 60's. The dub wasn't bad either, though I'm looking forward to watching it again with subtitles. Easily recommended for just about anyone.